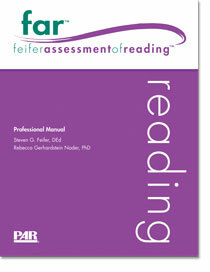 The Feifer Assessment of Reading is a comprehensive assessment of the multiple processes involved in reading and is aimed at identifying an examinee's specific subtype of reading impairment. It can also be used to screen for dyslexia, to monitor progress in developing discrete skills such as might be part of an RTI program, and to design skill-specific interventions. There are 15 subtests, although not all are administered to all students. Eight subtests are administered to prekindergarten students; 11 subtests to examinees in kindergarten and first grade; and 14 subtests to students in grade 2 and up. Individual subtests take just a few minutes to administer; the longest test times are 8 to 10 minutes. Examiners may administer the full grade-appropriate battery, just individual subtests, or only the subtests for a particular index. A separate Screening Form permits general screening for dyslexia. 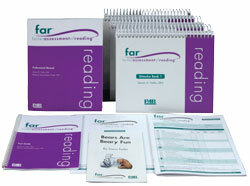 FAR Screening Index: This is compiled from the Phonemic Awareness, Rapid Automatic Naming, and Semantic Concepts subtests. The FAR was standardized on a nationally representative sample of 1,074 examinees in prekindergarten to college, drawn from more than 30 states. Test administration takes about 35 minutes for prekindergarten; 60 minutes for kindergarten and first grade; 75 minutes for Grade 2 and above; and 15-20 minutes for the Screening Form. In addition to the index scores noted above, a FAR Total Index is calculated as a composite of all subtest scores. Subtest and index scores are expressed as standard scores; percentile ranks, age and grade equivalents, z-scores and normal curve equivalents (NCEs) are also available, along with reliable change and discrepancy scores. In addition, it is possible to conduct an item-level skills-and-error analysis of the examinee's scores on specific subtests in order to take a more in-depth look at reading-related behaviors.